A state-of-the-nation group portrait, ‘Eight’ presents a series of deliciously cynical yet touching snippets of contemporary life, with eight young characters struggling to find glimmers of faith amidst the wholesale cynicism and apathy they face in society. Sweeping the board at the 2008 Edinburgh Festival, ‘Eight’ went on to rave reviews in London and New York. 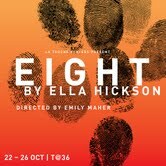 Now ‘Eight’ will grab Dublin audiences by the short and curlies for an intimate one-week run at T@36 at The Teachers’ Club on Parnell Square. Each night, the audience will “direct the show”, voting to determine in which order the eight monologues are performed. Moving from morbidity to hilarity, the characters search for meaning in a morally, spiritually and literally bankrupt world. From Millie, the jolly-hockey sticks prostitute who mourns the loss of the good old British class system, to Miles, a London 7/7 bombing survivor or Danny, an ex-squaddie who makes friends in a morgue; ‘Eight’ looks at what has happened to a generation that have grown up in a world where everything has become acceptable. Formed around the results of a survey that asked twenty-somethings what defined their generation, Hickson’s play tries to provide answers to their almost unanimous response of ‘apathy’. For updates visit LaTouche.ie or follow us on Twitter @LaTouchePlayers. An amateur performance by arrangement with Nick Hern Books. Two plays for the price of one!